Oh my word...look at this. CCM are based in Bolton, just a few miles from my humble (scruffy) abode. Their previous creation - The GP450 - was pitched as an adventure motorcycle with real genuine off road capabilities and mustered an appreciative following in adventure motorcycling circles. The GP450 offered some trick components, light weight and smart thinking wrapped in a practical purposeful package. I've never even ridden let alone lived with a GP450 but it struck me as being a motorcycle for the pragmatic person. In complete contrast they're bringing us the Spitfire. In keeping with the current trend for cafe racers, flat trackers, bobbers and other classifications that I don't understand the Spitfire is, erm, well, erm, er...in one of those genres I'm sure. 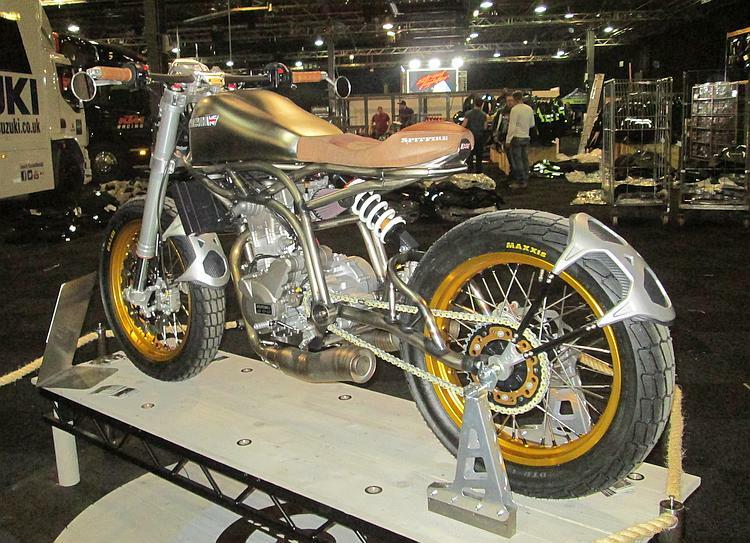 What I do know is that it is, as presented at the Manchester Bike Show, gorgeous. The frame, unpainted with heat tainting around the welds, the simple lines, the brushed something-or-other tank and the exhausts. Grrrrr! What I particularly take delight in are the spaces. Eh? The spaces, you can see through the bike, it's almost transparent. It is as minimalist as a motorcycle can be. A frame, an engine, 2 wheels, suspension, a tank and somewhere to sit and steer. In a world of motorcycles where just getting to a spark plug requires removal of 1/3 of the motorcycle the Spitfire suggests removing the engine would be a 15 minute job. You'd like to replace the rear shock? 10 minutes, job done. Oh imagine if all modern motorcycles were so easy to work on. 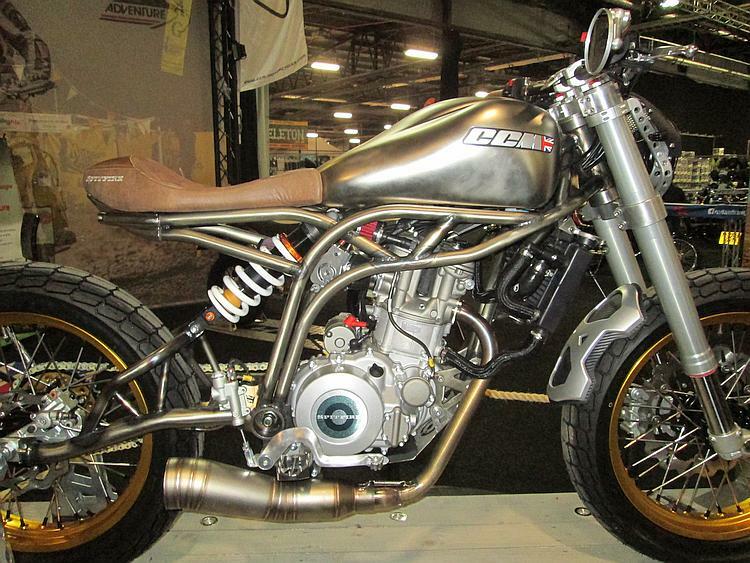 Engine, frame, suspension, wheels, somewhere to sit, 'bars and that's pretty much it. There are of course some catches, it's not a perfect world. Firstly I believe this is a prototype. Look at the bike again. Where is the battery and the ECU? Under the tank? If so tank range will be limited surely. 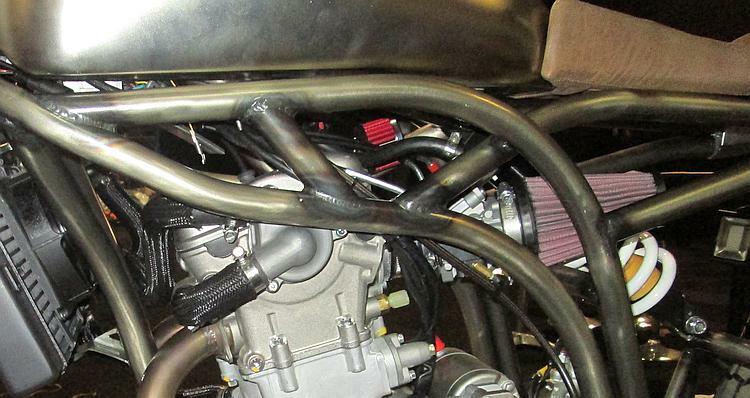 The air filter is a cone, will that pass noise emissions for homologation? Those exhausts are beautifully crafted but looking at the massive barrel silencers on modern models surely they will be too loud? I look forward to seeing how this works in the real world. Secondly it is of course completely impractical, the downside of beauty. While I could service the motor in an hour there's nowhere to put my top box and my saddle bags would fall into the rear wheel. While getting to the rear master cylinder is a cinch riding in the rain with no real mudguards will leave myself and the motorcycle covered in crud. This bike may make boys and girls swoon at it's beauty but there's nowhere to take a swooning pillion for a sensual ride. As far as I can tell there's not even a stand, I guess you'll have to find a nearby lamppost like a desperate dog. I suspect this is a motorcycle that you buy because it is so handsome, not because it is practical. You place it in your living room and look at it rather than the garage and you only wheel it out on warm dry days to go and pose with your pals at a local cafe. It is in fact everything I dislike - impractical and pointless - and yet - PHWOAR!! Stunning and yet completely impractical. We're looking for owner's reviews of their motorcycles. Real world reviews by real riders riding on real roads not professional testers on race tracks. Please Click Here. Handsome? In the eye of the beholder obviously. That frame is awful, having bends all over the place where it should be straight. Ken Sprayson's welds were much nicer than those, and the McCandless brothers would be turning in their collective graves. But as you say, the fashion victims will be queuing up. Beauty is in the eye of the bewildered Ian. Not only do I understand that it's impractical but as you point out curved metal is never as strong as straight stuff. But...well there's just something about this bike that catches my eye. Belstaff you say? Did you have black boots with white socks turned over the tops too? Oh I say Ian, tally ho! MZ'ers with donkey jackets and wellies...luxury! When I wur a lad we 'ad us mam's knitted jumpers an clogs. Doesn't float my boat I must admit, but I am renowned for my total lack of style or taste. Oh you lot are just uncouth heathens I tell ya. Pfffft. I guess it must be me. 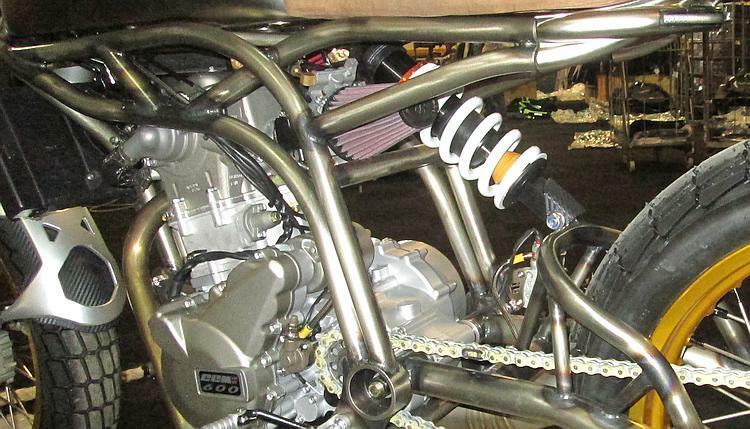 Is that the same ex bmw G450 engine? I wonder how many of the CCM have left? The bike is certainly an interesting concept, but is a long way from being finished and appears extremely impractical (where are you going to carry your luggage?). I've been looking at the RE Himalayan with increasing excitement! Apparently CCM uses a 600cc motor for the Spitfire. Rumour has it the adventure model will be upgraded to 600 as well. I saw the Himalayan at the show. It...it's not a pretty thing but that's not the point. What I hope is that it's frugal, reliable and well made. The sales bloke at the show certainly pressed my buttons, all the wrong ones. I think it remains to be seen what the Himalayan will be like although the concept of a lighter, smaller capacity, simple(ish) adventure type bike is a good one. Mostly because it is so very pretty. I wanted a single. I have never had one... I wanted a British Bike again and I have had a Triumph before. I wanted a light bike. Well, ideally the Tron Light Bike.. but, that is (apparently) not a thing so I went the other way. I do have a well worn Belstaff or two as well. HA! Cheers Adrian. I would enjoy hearing how you get on with it. As stated in the review while I think it is a thing of beauty it would never work for myself practically. As for the Tron Light Bike and the Belstaff you are showing your age. Ask ya (grand? )kids about Tron see how far ya get. Great bikes but CCM are a nightmare to deal with, constant broken promises re delivery, bike not to spec when collected and a total joke cost for 500 mile service - £220. Serves me right for being a fashion victim I suppose. Which bike have you got Andy? Fashion victim? Or an appreciator of beauty. No the CCM would never do for myself simply because I'm pragmatic and need certain things from a bike.